“Socialization processes that miseducate us can lead to our exploitation, can lead to our holistic underdevelopment, not only as individuals but as a collective community,” Cooper said as he introduced his book during the launch event held at UConn’s H. Fred Simons African American Cultural Center in Storrs. Cooper’s wife, Monique Cooper, a career consultant at UConn’s Center for Career Development, provided introductory remarks, which were followed by a presentation of the book cover art by the artists, UConn alumni Taylor Mayes and Steve Cartagena; a book talk by Cooper; a moderated Q&A; and a book signing. Cooper credits his family, who he says raised him with the value of education and instilled in him the importance of being an active agent of change, as the motivators that led him to write this book. He says he also took inspiration from scholars and activists, such as Harry Edwards, author of The Revolt of the Black Athlete and founder of the Olympic Project for Human Rights, as well as athletes who used their careers as a means to pursue social justice, such as Paul Robeson, Muhammad Ali and Arthur Ashe. 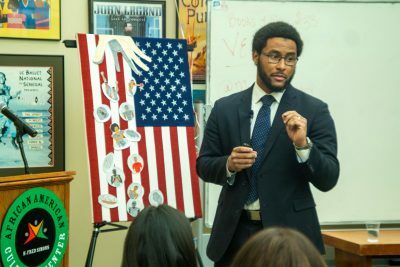 “From an early age, it was instilled in me the importance of being an active agent of change, and I felt like writing a book that was going to be able to be disseminated to a wide range of people would be a means to do that,” said Cooper, who also serves as the faculty founder of Collective Uplift, an organization designed to empower and support minority students through education and resources that will help foster their holistic development within athletics and beyond. Cooper says he recognized a need for a more complex conversation about Black male holistic individuals who participate in sport and about the heterogeneity of their lived experiences. Writing the book provided a way for Cooper to open up that conversation and discuss the monolithic and stereotypical perceptions of Black males, including the “dumb jock” perception that stereotypes Black males as being athletically gifted and intellectually inferior. At the same time, the book highlights strategies for holistic development and collective uplift not only for Black males, but also the Black community at large. Cooper offers strategies for Black male holistic individuals, their families, and communities to counteract the oppressive nature of society, such as beginning the empowerment of Black males in the household at a young age and treating sporting events as a means for sharing information and addressing social problems, rather than solely for entertainment. He also provides recommendations for transforming youth sports into a space that informs young people about activism and advocacy to facilitate social change — for instance, by implementing mentorship programs and hiring more Black males as coaches, teachers, and administrators. In regard to interscholastic athletics, Cooper suggests sports teams form partnerships with community and professional groups to encourage holistic development in Black male athletes, rather than focusing exclusively on athletic development. At the college level, Cooper recommends implementing culturally relevant organizations, such as Collective Uplift, that offer Black male athletes a space to integrate themselves into the campus community beyond athletics. “The main difference between this book and other books written on this topic is the fact that it accounts for the heterogeneity among Black males’ experiences in diverse sporting and educational spaces,” Cooper says. According to Cooper, the book also differs in that it incorporates multiple theoretical lenses to analyze those heterogeneous experiences, focusing on the experiences and outcomes of Black male holistic individuals across their lifespan, rather than only considering their experiences during their athletic careers, as other works do. The Illusion of Singular Success Model details the belief among Black male athletes that sport is the only route to success, leading to identity foreclosure after their athletic careers, accompanied by depression, dissatisfaction, emotional trauma, and in some cases, death. The Elite Athlete Lottery Model demonstrates the diverse experience of elite athletes, rejecting the popular narrative that all athletes are financially stable once they have reached the professional level. Cooper explains that athletes who make millions in a short-lived athletic career often face bankruptcy after their professional career. The Transition Recovery Model describes the process by which Black males are initially socialized to and/or internalize athletic identity salience and engulfment during their athletic careers, but subsequently experience identity transition empowerment after their careers conclude due to exposure and engagement with a range of positive supports. He notes Collective Uplift as an outlet for students to discuss and anticipate the transition into life after sports. The Purposeful Participation for Expansive Personal Growth Model underscoreshow sports should be utilized as a means to an end, rather than an end in itself, giving Black males a greater purpose beyond their participation in sport. The Holistic Empowerment Model emphasizes the importance of Black male athletes developing a social consciousness about the exploitative systems at play. Cooper notes his specific focus on Black males was due to his belief in the importance of people who have a personal connection to an experience also authoring texts that describe and explain those experiences. As a former athlete, Cooper experienced an identity crisis after his athletic career ended and he no longer felt successful in anything other than sports. Drawing from that experience, Cooper says he wanted to understand how Black male athletes are being socialized and treated in society. Aside from those among the general public who are interested in the topic of intersection between sport, education, race, class, culture, and gender, Cooper says his intended audiences for the book are Black male holistic individuals, their families, school administrators, educators, coaches, community members, and undergraduate and graduate-level college students. “I look at the book as an opportunity to have a paradigm shift in our society around the conversation of the intersection in race, gender, sport, and education,” says Cooper, who has seen Collective Uplift, the organization he founded as a psycho-social support group for Black male athletes, also undergo a shift in a positive direction. 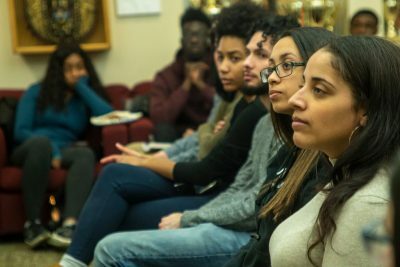 With more than 30 members at UConn and more than 20 alumni, Collective Uplift now also has two other chapters — at Old Dominion University and Texas Southern University. Eastern Connecticut State University is looking to begin a chapter as well. Meanwhile, the organization is also making strides in reaching athletes at the youth level. “It was important for me to not only research this information, but also actively be involved in creating systems and support to improve the outcomes,” Cooper says. Learn more about Collective Uplift.